We may know a great deal about how cells interact with their environment and each other, but we haven’t been able to get down to the nitty-gritty of how those signal pathways work at a molecular, or even cell-wide, level. Traditional tools like atomic force microscopy, optical tweezers and magnetic microbeads are much bigger than the individual receptors we’re trying to study, so they engage too many mechanoreceptors at once. We need finer, more precise tools. That’s what Young-wook Jun’s research group can now offer researchers, he showed Saturday. 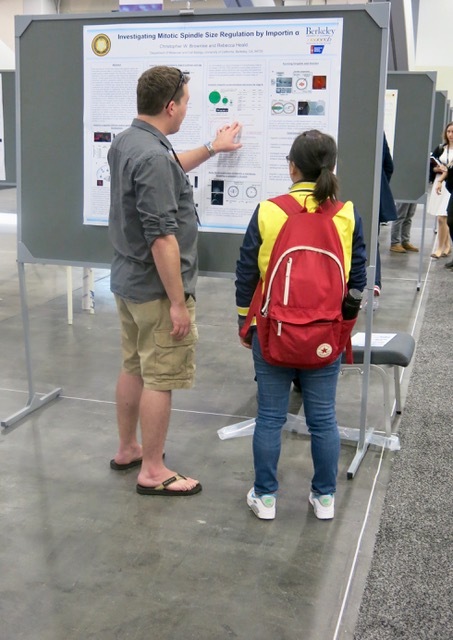 Jun, an associate professor at UC San Francisco and organizer of the subgroup on nanotechnology approaches for interrogating cell signaling, discussed how his lab’s work with magnetic nanoprobes is creating new ways to observe biomolecular processes at the nano-scale. As part of their new mechanogenetic toolkit, the group has synthesized magnetoplasmonic nanoparticles – MPNs – that are similar in size to mechanoreceptors such as Notch and E-cadherin. Each is made of three parts: A magnetic core for force generation, a gold shell for imaging, and a targeting region for interacting with an individual receptor. Once a nanoprobe engages a receptor, magnetic tweezers can be used to manipulate the receptor and cause spatial changes that can be imaged at a molecular level. Stronger forces can be applied by moving the tweezer closer to the cell’s surface, inducing activation of the receptor. The group has demonstrated the MPNs on both Notch and E-cadherin, measuring cellular responses to spatial, chemical, temporal and mechanical inputs.